Edinburgh UNISON will lobby the City of Edinburgh Council budget meeting on Thursday 21 January 2016 from 08.45-9.45 against 2,000 job losses and £160 million in cuts to services over four years. 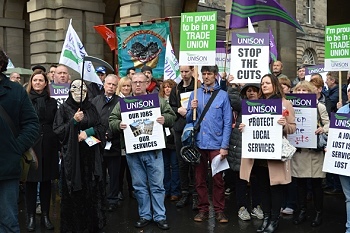 Tom Connolly, UNISON Edinburgh lead negotiator, said: “On top of the existing quest to find £150 million in cuts, the recent Scottish Government financial settlement means Edinburgh has to find another £10 million in cuts to jobs and services. Tom Connolly congratulated the council administration from pulling back on some cuts in services and conditions but warned that much more needed to be done to avoid compulsory redundancies. “Councillors need to make sure officials are doing all in their power to avoid compulsory redundancies and we will work with them to do that. However, our long standing policy remains that any compulsory redundancy will lead to a ballot on industrial action”, he said. Amanda Kerr, UNISON Edinburgh branch secretary, said: “Once again it is the low paid and vulnerable, including children, elderly and disabled people who will be the worst affected by these cuts. Most council workers – about 10,000 – require protection of vulnerable groups (PVG) clearance to do their jobs. That’s how many provide direct services to children and vulnerable adults. It doesn’t take a genius to spot that those services are at risk.